The casual visitor to Yeovil Bus Station in Somerset in the ‘seventies could have been forgiven for not realising that the town was an important centre for the National Bus Company. In those days the town services avoided the bus station altogether, and the Tilling and NBC greens of the vehicles on Southern National’s country services were often outnumbered by the multiple hues of the independents. Some of these - the dignified brown and cream of Hutchings & Cornelius, the scarlet of Safeway, and the cheerful blue and cream of Wakes - could be found at almost any time during the week; others only worked in on certain days, particularly on Friday, the traditional Yeovil market day. Amongst these none was awaited with more interest by enthusiasts than the arrival of service 10 from Bruton, operated by the Brutonian Bus Company. For nearly twenty years Brutonian provided a valuable public service to the people of Somerset and a source of unending interest to the enthusiast fraternity. In the end it was unable to weather the storms of deregulation; which was ironic because it was just the sort of operation that both supporters and opponents of deregulation thought would prosper in the new environment. The motorbus came late to Bruton: not until 1935 did Western National divert some journeys on its Glastonbury – Shepton Mallet – Castle Cary service to serve the town. Whilst motor coach operators had been based in the town since 1923, none of them are known to have operated bus services and none held Road Service Licences for stage services under the 1930 Act until the arrival of Christopher Knubley in 1972. First coach operator in Bruton is thought to have been Reg West who started with one vehicle from his house at the top of Quaperlake Street in 1923. It is thought that he only had one vehicle and that he passed away in about 1950. Another early operator was Mr S J Harding, about whom little is known other than that he seems to have started around 1925 with a Chevrolet, replaced in 1931 with a Thornycroft. He appears to have ceased operating in 1935 when the Thornycroft failed to get a Certificate of Fitness. It may or may not be coincidence that 1935 was when the next operator began, in the shape of Messrs Powell and Rossiter who ran the High Street and Glen Garages. They mainly ran private hire and excursions but from 1952 they had a Road Service Licence for a workers’ service to Clark’s shoe factory at Shepton Mallet. They commenced operations with a Bedford WLB, replaced after the War with an OWB. Powell & Rossiter’s coach business was acquired in October 1953 by West End Garage (Bruton) Ltd, who used the fleetname “Brue Coaches”. The Bedford OWB only lasted for a couple of months with them, but was supplemented with a pair of Opels from Wessex Coaches and a Bedford SB. Most of their coach operation, including the Road Service Licences and the Bedford SB, was acquired by Wakes in August 1958, but it’s thought that they may have continued to run private hires for a short while afterwards. The two Opels are recorded as passing to Smiths of Pylle and Buglers of Bristol in September and October 1958 respectively. Bill Green was a former Wakes driver who set up his own operation in Bruton. It is thought that he may have started in 1958 by taking over the West End Garage’s taxi business. In 1959 he upgraded to an Austin minibus, then in 1961 to a Bedford SB. He only ran school contracts and private hires, an application for an excursion and tours licence having been successfully objected to by Wakes in 1963. He is important to our story for two reasons: he is the first operator who is recorded as using the “Brutonian” fleetname; and it was his business that Chris Knubley acquired 1972, which is where our story really begins. The Brutonian story is really a tragedy in three acts: Act One began in 1972 when Christopher Knubley acquired W Green & Son’s coach business along with Green’s only vehicle, a Bedford SB5 coach. As there was clearly no hope of expansion into excursions and tours in the regulatory regime of the time, Mr Knubley orientated the business towards running bus services. 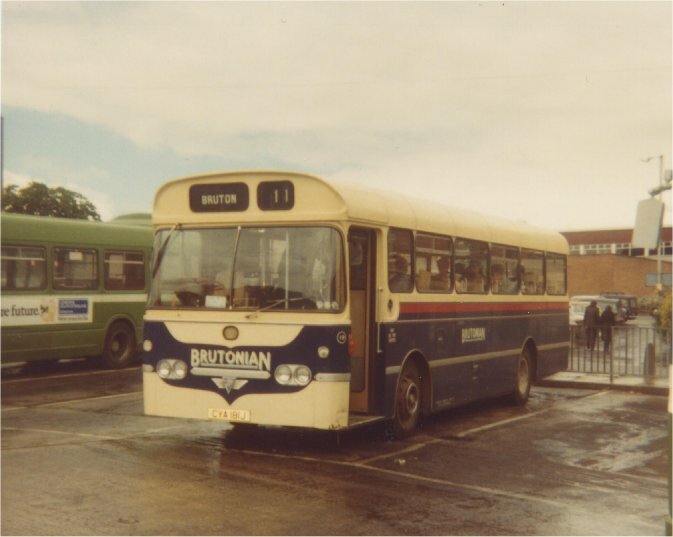 The fleetname was changed to Brutonian Bus Company, although at that time the business wasn’t a company and the vehicles only carried BRUTONIAN. 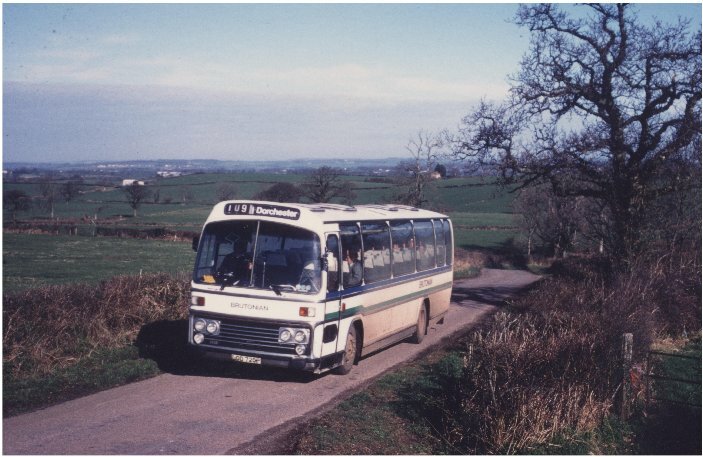 In fact the very first licensed services to start in July of 1972 were three express services restricted to the carriage of persons attending Bingo at West Pennard on Mondays, Evercreech on Saturdays, and Castle Cary on alternate Wednesdays. It is possible that these were continuations of private hires operated by Green’s. Exactly how the condition was enforced, as there was no requirement for passengers to be members of anything, is not known: were travellers escorted off the bus and forced to buy Bingo cards? 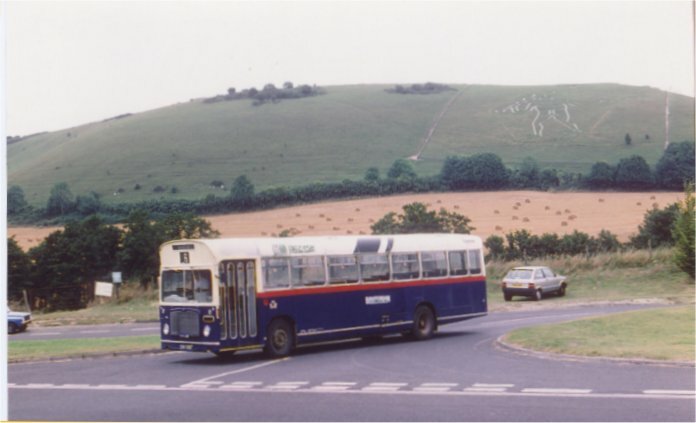 The first proper bus services started in August 1972: a pair of long-distance market day shopping services from Bruton to Salisbury and Dorchester on Tuesdays and Wednesdays respectively. Services such as these have become a staple of independent operators in recent years, as they fit in nicely between school contracts, but Brutonian’s routes were innovative in the area at the time. Initially the services operated fortnightly on express licences, but after a couple of months they were changed to stage carriage services and increased to operate weekly, and the Dorchester service rerouted away from Sherborne and the Cerne Valley to run via Stalbridge and the Piddle Valley; additionally a third service was added from Bruton to Yeovil on Fridays which followed a meandering course designed to serve as many villages off the main roads as possible. A Saturday service was added to the Yeovil route in March 1973. A major development occurred that April when the first regular bus service started. The Western National 480 between Bourton and Shaftesbury via Mere had for some time been out on a limb following the withdrawal of the other WNOC services in the area, and Mr Knubley took this over and extended it from Bourton to Wincanton and Bruton. Initially the 480 route number was retained, but around 1974 a route numbering system was started under which the Salisbury, Dorchester, Yeovil, and Shaftesbury services became 8, 9, 10, and 12 respectively, although comparatively few vehicles were equipped to show them, and it is interesting that these four routes remained the basis of Brutonian’s services throughout its life, whereas many subsequent additions were to fall by the wayside. In June 1974 the Bingo services to West Pennard and Evercreech were converted to stage services (the Castle Cary service seems to have ceased) and became part of route 2, which also included a works service from Bruton to the Unigate works at Evercreech, and a Saturday evening service to Shepton Mallet covering journeys recently withdrawn by Wakes. Additional schoolday journeys were added to the route in 1978 when some contracts were made public. Route 11 appeared in November 1974 and was actually a variant of the route 12; it was very difficult to tell what the exact difference was between these routes unless you realised that the service now required two vehicles and that the route numbers were also running numbers. The bus on route 11 made all sort of schoolday diversions and took various shortcuts on its positioning journeys (all of which ran in service) so that what had been a very simple timetable became dauntingly complicated. Later a third bus was added to the route on schooldays, but this, confusingly, also used route number 11. Most of the missing route numbers were operated by Ray Cuff of Piddletrenthide in Dorset, whose services were marketed as part of the Brutonian network from this time, although this arrangement later ceased, and whereas Brutonian was to suffer two changes of ownership before its eventual demise in 1991, Mr Cuff stayed in business until August 2002 operating on routes not very different from those of 1975. The main interest for enthusiasts in the Brutonian operation was Mr Knubley’s vehicle policy which tended towards heavyweight buses with a particular preference for AEC Reliances and Bristol REs. This however did not preclude the purchase of the occasional lightweight or coach and the result was a fascinating fleet. Early arrivals included RWV 548, a 1958 Reliance / Duple centre-entrance coach from Gastonia; TET 166, a 1959 Rotherham Reliance / Weymann bus; 217 UYC, a 1963 Reliance / Harrington bus from Hutchings and Cornelius; JNT 252E, a rare Bedford VAL / Willowbrook bus from Wakes; BND 877C, a Manchester Panther Cub / Park Royal; YYB 118, a Dennis Lancet UF / Harrington bus from Hutchings and Cornelius; YNN 773, a 1958 Barton Reliance / Alexander coach; 771 NJO, an Oxford Reliance / Marshall bus; NAM 995, a delightful Bedford SBG with curvy butterfly-fronted Duple Vega coach body, acquired from a non-PSV operator in Shaftesbury as a stop-gap; OVL 495, a Lincolnshire SC4LK; YRT 896H, a Lowestoft Swift / ECW; TRN 769 a Ribble Leopard / Marshall bus; and of course from Chesterfield came 497 ALH, former London Transport Reliance / Willowbrook RW3. With such a fleet, one can understand the interest with which the arrival of a Brutonian service was awaited; who knew what might turn up? No 15 (497 ALH), better known as London Transport RW3, in Motcombe on route 12 in June 1984. The Brutonian livery during the Chris Knubley era, on those vehicles that could be spared from service long enough to receive it, was a lovely deep blue and cream, usually with the waistband or other styling feature in red. Since painting only usually occurred when a bus was stopped anyway for mechanical reasons, the least reliable vehicles tended to get repainted first; RW3 ran around for years in Chesterfield green before it stopped running for long enough to get repainted. The fleet was numbered in a simple series from 2 upwards. Why it started at 2 is not clear, but it’s possible that Mr Knubley may have regarded Mr Green’s first Bedford SB as Brutonian number 1. To accommodate the growing fleet, in 1975 the business moved to a large yard at Bruton station, where the remains of South Wales Weymann-bodied Tiger Cub JBO 124, which had been purchased for spares by Ray Cuff from Somervale Coaches, served as a store and office until it fell apart and was replaced by a caravan; a large modern workshop was constructed, and a fuel tank installed. This establishment featured rather pretentiously in timetables as Bruton Bus/Rail Station. An innovation in 1980 was prompted by the withdrawal of Hants & Dorset services to Mere and Zeals; a Saturday service was added to route 8 to Salisbury, and on the days when the through bus didn’t run, a service of two journeys each way ran from Bruton to Hindon where they connected with Hants & Dorset 225 to and from Salisbury. The Saturday service remained a feature until the end, but the Hindon shorts only lasted eight months, suggesting that Hants & Dorset may have been right. The old-established firm of Hutchings and Cornelius of South Petherton ceased operations in May 1979. 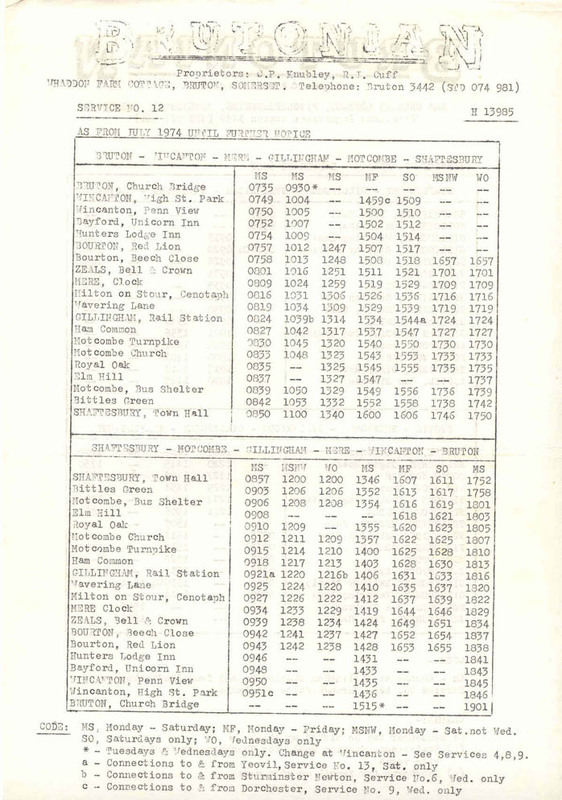 The services towards Yeovil passed peacefully to neighbouring Safeway, but both Western National and Brutonian applied for the two routes to Taunton: a regular service from Martock and a Saturday shopping service from Westport. Both services were operated to the existing timetable by Western National on a temporary licence pending a traffic court hearing, the result of which was that from July Western National kept the Martock route as its 263, and Brutonian took the Westport service as its 15 and extended it back to South Petherton via a devious routing to avoid competing with the 263. In an attempt to find more trade it was increased to run on Wednesdays as well as Saturdays. At the same time new route 14 started on Fridays, which meandered from Bruton to Taunton in a desperate but largely unsuccessful search for passengers. The 15 probably started too far away from the Bruton depot to be economically operated, and in October it was transferred to Safeway. Route 14 was passed to Barber of Barton St David in December 1980 although the licence appears to have remained with Brutonian, but it was withdrawn the following year. The demise of Hutchings and Cornelius also provided Brutonian with two more vehicles, AEC Reliances WYD 928H and CYA 181J with respectively Willowbrook and Plaxton bus bodies. Being only ten years old, they were, with the exception of the Lowestoft Swift, by far the newest vehicles in the fleet. Other buses acquired at this time were GAX 5C, a Red & White Bristol RE; and 8087 TE, a Lancashire United AEC Reliance with Plaxton bus body, whilst one morning in 1979 I was astounded to find a white Leyland National demonstrator roaring up Wincanton High Street on route 12. They surely didn’t really think that Brutonian might buy one? Quite unprecedented was the purchase in 1982 of no less than four East Lancs-bodied Bristol REs from Hyndburn, formerly Accrington. MTJ 926/7G and STC 928/9G were noteworthy in that their blue and red livery was deemed to be sufficiently close to Brutonian’s to render repainting unnecessary, and their fleet numbers of 26-29 fitted into the Brutonian sequence. Although they looked very smart on arrival, their paintwork turned out not to have been of high quality and by 1987 much of it had disappeared leaving them with a very disreputable appearance. The final acquisitions under Chris Knubley’s control were two Bristol REs, OUH 768F and OHW 596F, originally with Bristol Omnibus, acquired from Gastonia in 1985. No 30 (OHW 596F) was one of a pair of former Bristol Omnibus Bristol RELL6Ls acquired from Gastonia in 1985. Route-wise the early ‘eighties were quiet, apart from constant fiddling with routes 11/12. 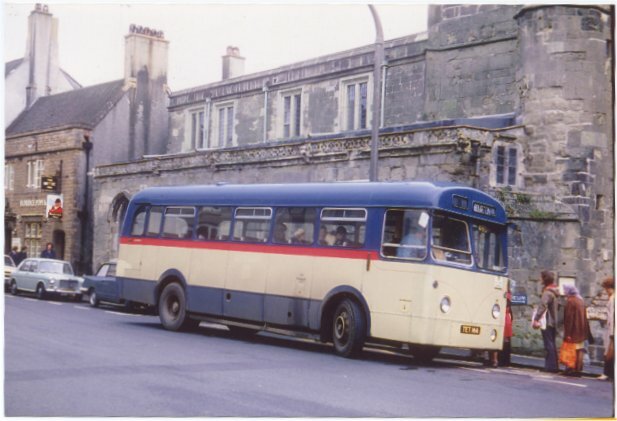 Route 2 gradually ran down, losing the Monday evening Bingo bus in 1979, the Saturday evening Shepton Mallet service in 1981, and finally the Evercreech works journeys and Saturday Bingo bus in 1986, leaving just the school journeys surviving at D-Day. Brutonian also ran private hires until the introduction of tachograph regulations, and for a few years in the late ‘70s and early ‘80s operated a Somerset County Council Bedford VAS on a school contract. Chris Knubley was never a great fan of Bedfords, and was particularly unimpressed with this vehicle. 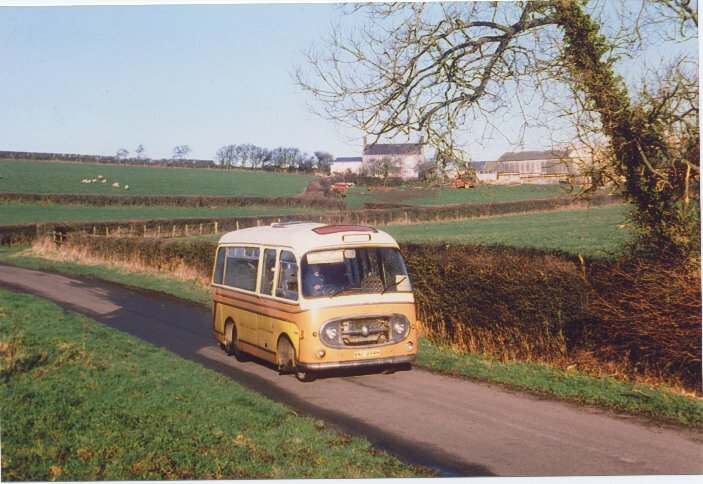 Act Two of the Brutonian story began with deregulation and it featured local entrepreneur Tony Tucker, whose interests included a travel agency called Air Camelot, which owned a Ford Transit minibus and a Bedford YRT coach. Air Camelot had registered six commercial minibus shopping services centred on Wincanton from D-Day, most of which appeared to have been based on routes abandoned as unremunerative by Wakes in the ‘sixties. In July 1986 Chris Knubley approached Tony Tucker with a view to selling the Brutonian operation to him; negotiations were successfully concluded and a limited company, Brutonian Bus Company Ltd, set up to take over the business from D-Day. On the advice of the Traffic Commissioners Tony Tucker also kept the Air Camelot licence in his own name for a while, but the two businesses were managed as one, and the Air Camelot licence was later surrendered. The commercial routes were given letters A to F, and most had gone within a year, only one survived more than two, and some only lasted three months. In most cases enthusiasts outnumbered “normal” passengers, especially when a vehicle shortage forced the hire of an RF from Shaftesbury and District to operate them (fortunately the Traffic Commissioners were too busy at the time to notice that this was about four times bigger than the vehicle size specified on the registration). 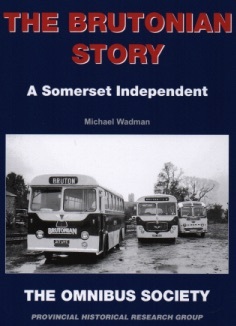 The communities they served had had many years to get used to not having a bus service, and anyway Wincanton had been in decline as a shopping centre for some years ever since the building of the A303 bypass had taken away all the passing trade. Indeed, the only routes to survive were those which went elsewhere: the A, later 15, to Shepton Mallet, which lasted until September 1988; and the D, later 18, which served the villages of Buckhorn Weston and Kington Magna. Although originally running to Wincanton, it was quickly changed to go to Gillingham as a replacement for a service of Ray Cuff’s which had had its registration withdrawn at the last minute. Further expansion in 1987 under enthusiastic traffic manager Ian Trotter saw new commercial service 20 on Saturdays from Yeovil to Bristol, and service 16 from Frome serving the tourist attractions of Longleat House and Stourhead Gardens which utilised the vehicle off the 14; both lasted four months. Route 21 consisted entirely of positioning and fill-in journeys between Bruton, Sherborne, and Yeovil for the vehicles on the tendered services, and disappeared when the relevant tenders were lost. The new ownership with its connection with Mr Tuckers’s travel agency business also brought a move into coaching activities and this became an important part of the business. As a result an increasing number of coaches was purchased. There was also a change in vehicle policy, Bedfords and other lightweights now being favoured. A number of small capacity vehicles, suitable for the tendered services, was also acquired, including two Ford Transits and three Bedford J2s, one of which had Caetano bodywork. Most of the vehicles inherited from Chris Knubley were disposed of to Martin Perry in a big clearout in October 1987. The new vehicle policy was not to Chris Knubley’s liking, and he left the firm that he had created. This deprived Brutonian of his engineering expertise just at the time when its operations were expanding, which unfortunately led to operational and maintenance difficulties. A rapid influx of vehicles only added to the problem, and as the back of the yard filled up with failed buses service reliability began to suffer. The livery also changed, with the red replaced by a rather sickly green, but few of the new acquisitions ever received it. 1988 was a bad year for Brutonian. Route 1 was surrendered in March as a result of the difficulties and cost of outstationing a vehicle at Yeovil, and was retendered to Southern National. Staffing difficulties at the Dorchester outstation led to Route 6 being surrendered in June; Dorset County Council arranged for the route to be taken over by Pearce Darch & Willcox (Comfy-Lux) of Cattistock. The peak hour journeys on the 14 were replaced by Badgerline’s new 166 in July, and all the remaining tendered routes were lost on retendering by the end of the year. With the reduced number of bus services, Driver / Assistant Traffic Manager Mike Smallbone left Brutonian to set up Stirling Travel which took over the remaining schoolday services on route 2. Brutonian ran route 14 commercially after losing the tender to Wakes in August, but passed it to Stirling Travel after a few weeks; and the Saturday service on the 10 was withdrawn in August. Then in September Southern National returned to the Wincanton - Mere - Shaftesbury road with minibus service 59, competing head-on with Brutonian’s 11/12, on which the Saturday service was as a consequence lost on retender in November. At the end of 1988, Brutonian’s route network was reduced to service 8 to Salisbury on Tuesdays and Saturdays, 9 to Dorchester on Wednesdays, 10 to Yeovil on Fridays, 11/12 to Shaftesbury Mondays to Fridays, and 18 to Gillingham on Thursdays. Concern about reliability and missed journeys led Wakes to divert their Salisbury service 28 via Wincanton over the route of Brutonian service 8 from December, and to register services to Dorchester and Yeovil on the same timings as routes 9 and 10. Before the registrations could take effect however, Act Three started in January 1989 when Tony Tucker sold Brutonian to the Cawlett Group. It was that group’s first outside acquisition since it had been set up in 1987 to purchase North Devon (Red Bus) and Southern National from the NBC, although it was soon joined by Pearce Darch & Willcox (Comfy-Lux), Taylor’s of Tintinhull, Smith’s of Portland, and Dorchester Coachways. The legal vehicle that Cawlett used for this purchase appears to have been an off-the-shelf company called Bondco No 5 Ltd, which acquired the goodwill of the Brutonian business and the Bruton depot, but not the vehicles which remained the property of the existing company and were sold separately, many of them to Marsh’s Coaches of Wincanton. Companies House records show that The Brutonian Bus Co Ltd was renamed Anthony Tucker Ltd at the end of January 1989, and Bondco No 5 Ltd duly renamed Brutonian Bus Co Ltd in March, but the existing Brutonian O Licence, PH4499, appears to have remained in use, even though for several weeks there appears to have technically have been no such company. A collection of Southern National Bristol LH / Plaxton grant coaches rendered surplus by the influx of minibuses was drafted in to Brutonian to cover services pending a permanent allocation, which was painted in a rather anaemic livery of all over white with thin blue and green stripes. Some Ford Transits were also allocated to Brutonian, but these managed to escape the new livery, one of them by being stolen! Leyland Leopard No 2439 (LOD 720P) working Southern National route 109 to Dorchester in 1989. The situation on the Shaftesbury road now became rather silly: Southern National coaches on loan to Brutonian competed head-on with Southern National minibuses. The competition was eventually eliminated by drastically reducing Brutonian’s presence; from March the 11/12 (still shown on timetable leaflets as a vulgar fraction) was reduced to a single Mondays to Fridays shopping trip, a couple of peak-hour workings, and various schoolday and positioning journeys. The daytime shopping journeys were withdrawn in May 1990. However, some rudimentary market research suggested that further expansion of long-distance shopping services was the way forward. Accordingly, in August 1989, Southern National’s X30 Saturday service from Yeovil to Exeter, which they were having difficulties resourcing, was transferred to Brutonian, renumbered 1 (although in practice the vehicle often continued to show X30), and extended back to start from Bruton; and several new weekly services (numbered 2 to 7) were introduced to Bath, Yeovil, Sturminster Newton, Wimborne, and Dorchester. Unfortunately, Brutonian were neither the first nor the last bus company to discover that passengers who advocate new services don’t necessarily travel on them, and only the 1 to Exeter and 2 to Bath survived more than a year. The established route 9 from Bruton to Dorchester was diverted from September from its traditional route down the Piddle valley to use the unclassified road along the ridge between the valleys of the Cerne and Piddle. Besides the X30, Cawlett also used Brutonian to take over other operations that Southern National were having difficulty resourcing: route 58D was assumed in November; this comprised two round trips between Sturminster Newton and Henstridge where it connected with Southern National 58 to Yeovil. Other services worked by Brutonian were the Tuesday and Friday route 64 from Charlton Adam to Yeovil, and the Saturday 109 from Marnhull to Dorchester, although these remained licensed to Southern National. 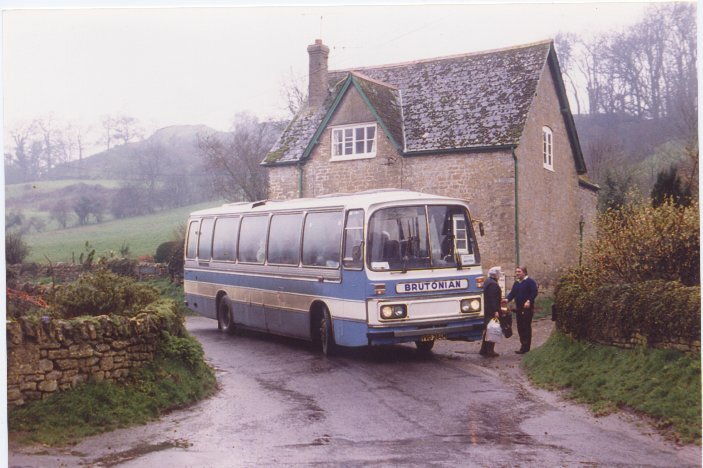 A new Dorset CC supported experimental service from Bruton to Sherborne started in December 1990 and was given route number 3, but it was Brutonian’s swansong, and services 1, 2, and 3 were all withdrawn in June 1991. The decline in bus services had however been matched by an increase in private hire, but unfortunately Cawlett did not appear to regard this as a core activity and the company ceased trading after 19th July 1991 except for one last private hire the next day. The remaining afternoon peak journey on the 11/12 was integrated into the Southern National 59, and the school journeys replaced by Marsh’s Coaches of Wincanton. Route 10 became Southern National 65, but was replaced by Wakes in 1991. Routes 8, 9, and 18 passed to Pearce Darch and Willcox, which by now was also owned by Cawlett; 8 and 18 were soon withdrawn and replaced by services operated by Wakes, whilst 9 was truncated to start from Wincanton and was transferred to fellow Cawlett subsidiary Dorchester Coachways in 1997. Southern National took back the 58D for one day before withdrawing it, and the 64 was transferred to Pearce Darch and Willcox, although it remained registered to Southern National. Little now remains to mark the Brutonian story. The Brutonian Bus Co itself was wound up in November 2001 after having spent some time as a dormant company. No less than four former Brutonian vehicles are either preserved or under restoration, but sadly the blue, cream, and red livery lives on only in enthusiasts’ photo collections. Chris Knubley and Tony Tucker have left the industry, but several Brutonian staff went on to start their own businesses. Ian Trotter became Traffic Manager at Marsh’s Coaches before setting up Brue Travel, which operated a number of Wiltshire CC tendered services. Mike Smallbone set up Stirling Travel which operated a number of bus services in the early ‘nineties with a small but interesting fleet. Driver Alan Curtis formed CT Contract Services which operates a number of tendered bus services, restored a Guernsey Railways Albion Victor, and has now taken over the bus services on the Island of Alderney. The Brutonian yard and workshop were later used by Stirling Travel and are today occupied by a coach company called Unicorn Travel. The Shaftesbury road is once again the preserve of Southern National, nowadays First Somerset and Avon, whilst the services to Salisbury and Yeovil are now run in somewhat different form by South West Coaches, successors to Wakes, who also operate a somewhat revised route serving Buckhorn Weston to replace that last remnant of Tony Tucker’s enterprise. 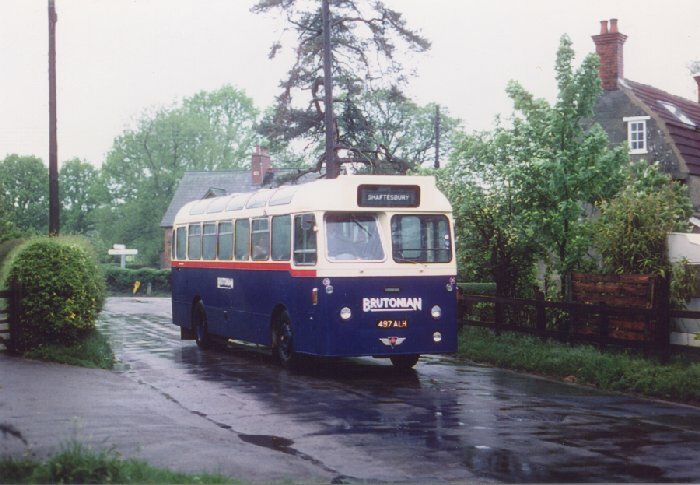 The very first bus service to be operated by Brutonian was route 9 to Dorchester which started on 2nd August 1972, so it is fitting that it was also the last to survive: Dorchester Coachways’ final journey on route 9, the last direct historical link with the Brutonian Bus Company, ran on 24th May 2000; the following week Wakes diverted the northern end of their existing 109 to cover the 9’s routing. The author would like to thank the Omnibus Society and the PSV Circle for permission to use information extracted from their publications; Derek Persson, in his capacity of Western Traffic Area Route Recorder for the Omnibus Society, for his invaluable assistance in documenting the Brutonian route history; Roger Grimley, Trevor Bartlett, Paul Weller, Stuart Turner, and Andrew Tucker for information on Brutonian’s vehicles, operations, and antecedent; Ian Trotter for providing much information, and also, with Chris Knubley, for, over the years, answering questions, supplying timetables, and permitting access to the yard. Chris Knubley passed away in Scotland in 2010.
an illustrated fleet list can be found here.